Subaru will add a new SUV model to its stable for the 2013 model year. The Subaru XV Crosstrek will be the company’s smallest SUV model costing several thousand dollars less than the larger Forester. The compact crossover will be built off the Subaru Impreza’s platform, but will offer its own front and rear fascias, wheels, body-side cladding, and a raised suspension. The XV Crosstrek helps Subaru target urbanites that are looking for the utility of a crossover with good fuel economy. The model will offer the same 2.0-liter 148 horsepower four-cylinder boxer engine found in the Impreza with a standard five-speed manual or available continuously variable transmission (CVT) with paddle-shifters. The XV Crosstrek will also come standard with all-wheel drive. The XV Crosstrek is smaller than most compact SUVs. It is more comparable to a Mitsubishi Outlander Sport than say a Honda CR-V in terms of cargo room. The model has cargo room of 22.5 cubic feet behind the rear seats and 52.4 cubic feet with the rear seats folded down. This is fairly close to the Hyundai Tucson(25.7/55.8), but much smaller than its larger sibling the Forester, which has dimension of 33.5/68.3. Subaru made large strides with fuel economy in the 2012 Impreza. That model is rated at 27-mpg city and 36-mpg highway with a CVT, making it the most fuel-efficient all-wheel drive vehicle sold in America. Since the XV Crosstrek, is essentially a raised and modified Impreza hatchback, expect fuel economy to be a bit lower with the added weight. 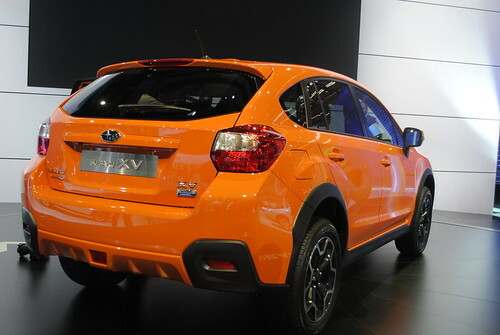 However, the XV Crosstrek will likely be the most fuel-efficient SUV on the market when it debuts. In comparison, the Nissan Juke, which is not even considered an SUV by the Insurance Institute For Highway Safety (they consider it a “small car”), gets EPA estimated fuel economy of 25-mpg city and 30-mpg highway with all-wheel drive. However, the Juke has 40 more horsepower than the XV Crosstek but does have less cargo room. 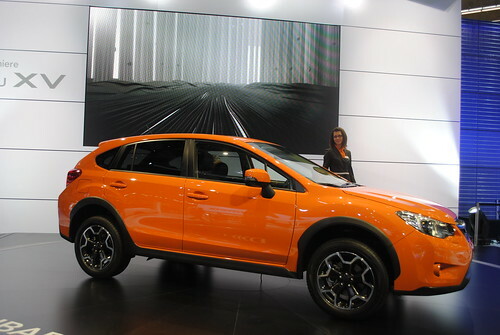 The 2013 Subaru XV Crosstrek will go on sale in Fall 2012 and have an interior largely the same as the Impreza. If you are looking for a higher ride height and more cargo and storage space, the XV Crosstrek is a good choice over the Impreza hatchback. Subaru will add some fun to the model by offering exterior colors such as orange. The XV Crosstrek is expected to have a starting price under $20,000. Subaru hopes the model fares much better than the Outback Sport, which was also a raised Impreza. Subaru is betting the XV Crosstrek’s practicality, style and fuel economy wins over buyers. The model could benefit from a turbocharged engine or diesel engine in the U.S. that would be more befitting its vibrant color options. Motor Trend estimates the XV Crosstrek will have a 0-60 time of between 10.2 and 10.4 seconds, which would lag all its competitors. Subaru is offering a diesel engine in the XV Crosstrek in overseas markets. Do you like the styling of the Subaru XV Crosstrek? There is a competition in the small SUV area to create vehicles with the worst rear vision possible. That swoosh downward of the window line toward the rear must be fashionable because almost all the SUVs have it, but it is ugly and it cuts vision. I sure hope this is not a hint of what any new version of the Forester will look like.